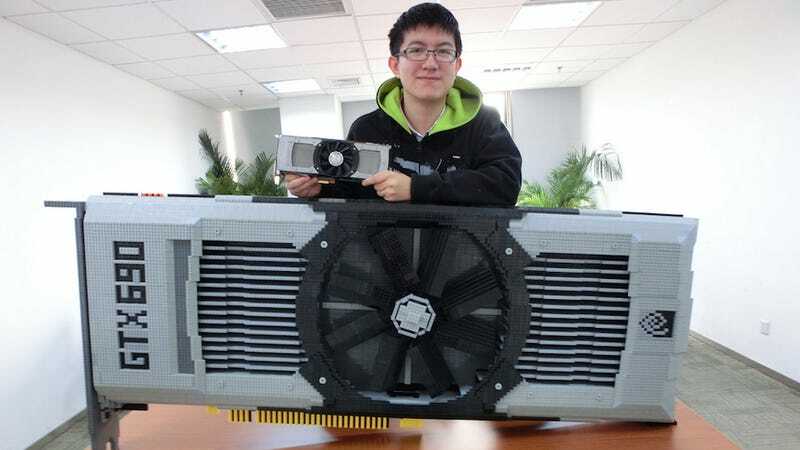 Xiosheng Li recreated his Nvidia GeForce GTX 690 graphics card as a massive Lego build. It's over six feet long and completely not functional, but pretty damn rad. Using 11,396 bricks and taking over three months, the cost of this build is around ¥10,000 (USD $1,640). "Xiaosheng used the Lego Digital Designer software to model the card, even managing to get the fan to function through the use of an electrical fan motor." Here's how he built the graphics card, with loads more photos.